During our camp’s practices, we will be focusing on general fitness, fencing footwork, and a variety of techniques for offensive, defensive, and preparatory actions. Then, we will apply those elements in fragments of bouts, bouts with assignments, and free bouting. Individual lessons are included. All this will improve the technical and tactical aspects of your fencing and will significantly contribute to your preparation for the new season. 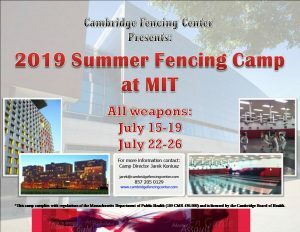 Attention commuting campers: All campers meet by the sign „Summer Fencing Camp” located in front of the entrance to the Z-center by the Kresge Parking lot (please see the attached Google map). Parents/guardians are asked by MIT administration not to drop campers at the Vassar Street Entrance for safety reasons. Thanks a lot in advance for your cooperation in this matter. Attention resident campers: check in at the dorm between 3-5pm the day before camp begins and meet for dinner at 6pm in the dorm’s lobby. 12:15 PM Lunch and camp adjourns; coach/counselor will walk with the campers back to assist with picking up luggage. All campers meet by the sign „Summer Fencing Camp” located in front of the entrance to the Z-center by the Kresge Parking lot (please see the attached Google map). Parents/guardians are asked by MIT administration not to drop campers at the Vassar Street Entrance for safety reasons. Thanks a lot in advance for your cooperation in this matter.